What did you see on your run today? Lots and lots and then some! As I do most Mondays, I took the dogs this morning to run in the forest at the Army Polo Club. After last night’s crash-bang-wallop of a storm, the air was cooler and cleaner and fresher this morning, and it was an absolute joy to be out, running and walking. The dogs rushed all over the place, excited by the cooler temperature, and I tried not to feel too sad at the sight of so many fallen branches. We saw peacocks dancing and horses being exercised. We saw cows, and lots of noisy lapwings trying to divebomb us if we approached their nests. 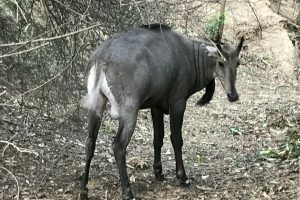 And, such a thrill, we also saw a nilgai. I haven’t seen one here for a couple of years at least, so it was a real joy. Eventually he headed off, but super relaxed about the whole thing.